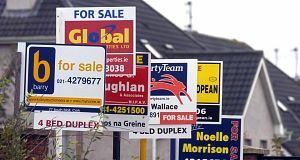 House prices nationally are back to 2002 levels, according to the latest figures from MyHome.ie. The total fall in house prices from the peak of the market in late 2006 is almost 35%. House prices across the country fell by an average of over 13% last year, according to the MyHome.ie Property Barometer published today. The average asking price nationally is now €271,000. In Dublin that figure is €314,000 – a 41% drop since the peak. Annette Hughes of DKM Economic Consultants, the author of the report, said it is clear that consumer sentiment remains fragile heading into 2011. “Although prices are back to 2002 levels, it is clear we have not yet reached the bottom of the market,” Ms Hughes said. “Confidence in the market remains weak as accessing credit remains difficult for some potential house buyers. “Other issues which will continue to adversely impact the market include the amount of unsold and vacant housing stock and the precarious financial position of some households following the December budget combined with the need to repay debt,”’ Ms. Hughes said. However Hughes also pointed out that with affordability now back to mid 1990 levels some of those who were priced out of the market during the boom years may be enticed back into the market during 2011. “There is undoubtedly an overhang of potential buyers waiting to enter the market when conditions improve and confidence is restored,” she said.